The DK707 7-Piece Drum Microphone Kit from Samson is a full-range microphone package for professional drummers. 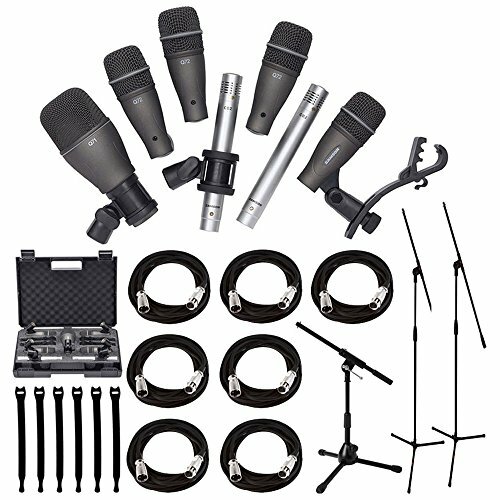 It includes four Q72 instrument mics, a Q71 kick drum mic, two CO2 pencil condenser mics for overhead miking, seven swivel-style mic adapters, four tension-mounted rim clips, and a hardshell carrying case. They can be used to mike a drum set in several applications for studio recordings, live stage, theater shows, rehearsals, and more. Featuring high SPL handling, the CO2 pencil mics have a frequency response of 40 Hz to 20 kHz to capture the overhead cymbals, while the Q71 and Q72 mics have a frequency responses of 50 Hz to 16 kHz to capture the bass drum and your snare drums and toms. Each mic is equipped with a swivel-style mic adapter. Ultimate Support MCTB50 Low-Level Tripod Mic Stand with Telescoping Boom,7 x -XLR Mic Cable 20 ft.